Spirit of Women magazine is a national publication presented to women by hospitals and their physicians. The magazine provides up-to-date, evidence-based healthcare information and promotes our hospitals as leaders in women's health excellence. 2 6 w w w. s p i r i t o f w o m e n . c o m | W I N T E R 2 0 1 8 | S P I R I T O F W O M E N Family Style go vegan… S o your child has come to you and announced that henceforth he or she will no longer be consuming anything related to an animal, including meat, fish, eggs, milk and other dairy products. What the heck is your new little vegan offspring going to eat? Probably a very healthy diet, say experts. It's becoming much less challenging to eat vegan as more people of all ages forsake animal products. According to a recent survey by Chicago-based food research firm Technomic, 45 percent of younger people regularly eat vegetarian and vegan food or follow a vegetarian diet, for reasons ranging from a desire for better health to concern for the ethical treatment of animals. 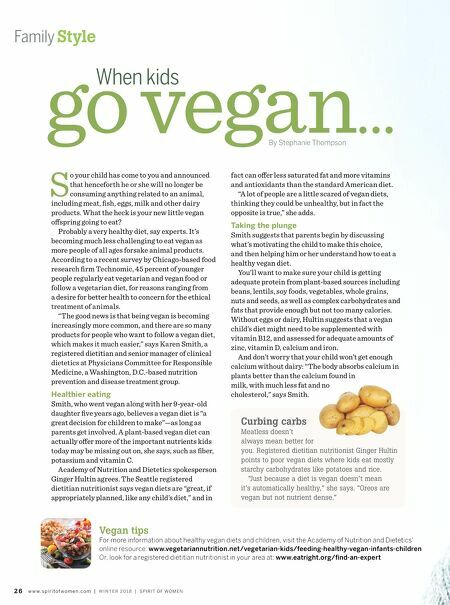 "The good news is that being vegan is becoming increasingly more common, and there are so many products for people who want to follow a vegan diet, which makes it much easier," says Karen Smith, a registered dietitian and senior manager of clinical dietetics at Physicians Committee for Responsible Medicine, a Washington, D.C.-based nutrition prevention and disease treatment group. Healthier eating Smith, who went vegan along with her 9-year-old daughter five years ago, believes a vegan diet is "a great decision for children to make"—as long as parents get involved. A plant-based vegan diet can actually offer more of the important nutrients kids today may be missing out on, she says, such as fiber, potassium and vitamin C. Academy of Nutrition and Dietetics spokesperson Ginger Hultin agrees. The Seattle registered dietitian nutritionist says vegan diets are "great, if appropriately planned, like any child's diet," and in Vegan tips For more information about healthy vegan diets and children, visit the Academy of Nutrition and Dietetics' online resource: www.vegetariannutrition.net/vegetarian-kids/feeding-healthy-vegan-infants-children Or, look for a registered dietitian nutritionist in your area at: www.eatright.org/find-an-expert When kids By Stephanie Thompson fact can offer less saturated fat and more vitamins and antioxidants than the standard American diet. "A lot of people are a little scared of vegan diets, thinking they could be unhealthy, but in fact the opposite is true," she adds. Taking the plunge Smith suggests that parents begin by discussing what's motivating the child to make this choice, and then helping him or her understand how to eat a healthy vegan diet. You'll want to make sure your child is getting adequate protein from plant-based sources including beans, lentils, soy foods, vegetables, whole grains, nuts and seeds, as well as complex carbohydrates and fats that provide enough but not too many calories. 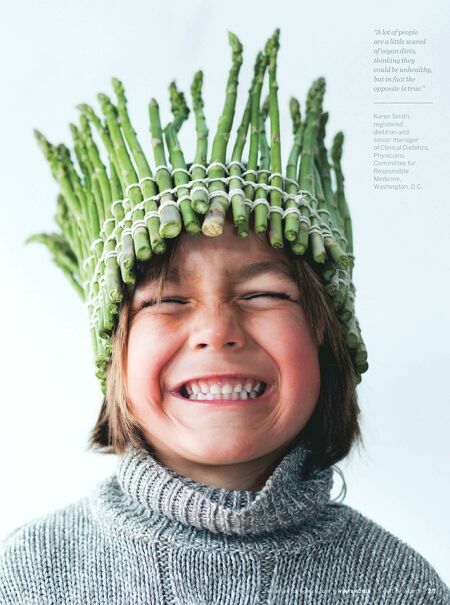 Without eggs or dairy, Hultin suggests that a vegan child's diet might need to be supplemented with vitamin B12, and assessed for adequate amounts of zinc, vitamin D, calcium and iron. And don't worry that your child won't get enough calcium without dairy: "The body absorbs calcium in plants better than the calcium found in milk, with much less fat and no cholesterol," says Smith. Curbing carbs Meatless doesn't always mean better for you. Registered dietitian nutritionist Ginger Hultin points to poor vegan diets where kids eat mostly starchy carbohydrates like potatoes and rice. "Just because a diet is vegan doesn't mean it's automatically healthy," she says. "Oreos are vegan but not nutrient dense."